Two Days Until Thoughtful Thursday Starts! I’ve always loved Pooh Bear. When Shawn was a baby, we purchased a 30+ volume set of “Disney’s My Very First Winnie the Pooh” books. To this day, I love reading them to Malia and Kassia at bedtime. The Hundred Acre Wood has countless life lessons to share. Whenever Pooh Bear is perplexed, he heads to his special place to, “Think, Think Think”. When reading the Many Adventures of Winnie the Pooh, you’ll enjoy tales of fun, friendship and learning to appreciate the little things in life. Like Pooh, I love taking time to just sit and think sometimes. It’s the simple life lessons that often speak to me the loudest in quiet times. 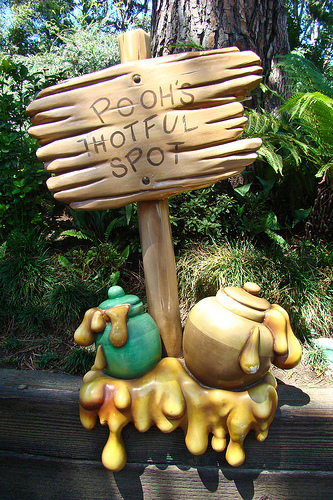 In honor of Pooh Bear and his love for going to his “Thotful Spot” to think, I’ve decided to run a special feature every week. I often collect thought-proving quotes. From time to time I reread and “think on them” for encouragement. On Thotful Thoughtful Thursdays, I’ll share simple motivational quotes that have touched me in some way. I’ve decided not to dissect the quote and share how it applies to my life. Rather, I’ll simply put it out there and hope that you will be able to apply the quote to your own life and be inspired too. I hope you enjoy coming to this Thoughtful Spot each Thursday, and that you’ll leave me a comment if a quote really speaks to you. This entry was posted in Disney, Family Life, Thoughtful Thursday and tagged Motivational Quotes, Pooh's Thotful Spot, Winnie the Pooh. Bookmark the permalink.